One of the oldest known breeds of dairy goats, Toggenburg Goats are also one of the most popular breeds. These hardy animals are good milk producers and have a lovely appearance. Toggenburg Goats have been kept for centuries in cool climates, where they thrive. They are good grazers and adapt well to most management systems. Toggenburg Goats do especially well in mountainous areas, as they are surefooted and agile! Extremely hardy, Toggenburg Goats are a good choice for any dairy farmer! Toggenburg Goats have a very strict breed standard. Generally, does stand 26 inches at the withers, and bucks are two inches taller. Does weigh more than 120 pounds and have a dainty appearance, while their masculine counterparts weigh more than 160 pounds. 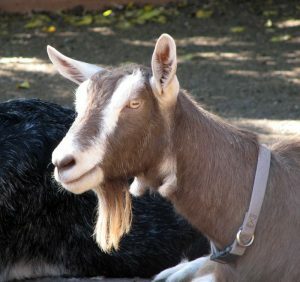 The heads of Toggenburg Goats are wide and dished, and bucks have a pronounced beard. Their ears are carried erect and are generally narrow and short above their alert, wide set eyes. The necks of Toggenburg Goats are long and slender, and no dewlap is present, though sometimes does have wattles! Although Toggenburg Goats may have horns, they usually do not. The bodies of Toggenburg Goats are long and angular, though quite wide, with deep chests and well-sprung ribs. The hindquarters are slightly sloped. Toggenburg Goats may be characterized by their long, strong legs and feet, prime for mountain pastures! Their hoofs are dainty but hard and squared off, and the pasterns are strong. The skin is pigmented, loose and supple, and the hair tends to be soft, medium length and sleek. Toggenburg Goats usually have long hair over their backs and thighs. In color, Toggenburg Goats vary greatly in shades of brown. Some are a rich chocolate color, while some are a light, grayish brown. There are white markings on the muzzle and around the ears, accompanied by two stripes running down either side of the face from the ears to the muzzle. Generally, the tail has two white triangles on either side of it! Often the lower legs are white as well, and sometimes a brown bracelet runs around the legs just below the knee. Sometimes there is a white spot near the wattles or the area where they would be. 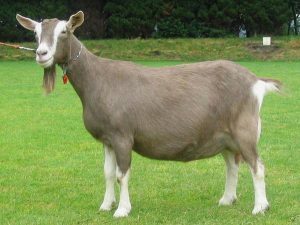 The average lactation period for a Toggenburg Goat is 257 days, and generally over 700 kilograms of milk may be expected, about four percent of that being fat. Toggenburg does have well attached pliant udders with well-defined teats. Originating in the area of Toggenburg Valley, Switzerland, the Toggenburg or Toggenburger Goats have had a herd book since 1890! They are widely thought to be the oldest breed of dairy goat known. They are occasionally used for their meat! Toggenburg Goats thrive in cooler to cold climates but are highly adaptable to many conditions. They should be housed for the coldest two to six months of each year and fed on mixed grass and fodder. Best adapted to mountain areas, Toggenburg Goats thrive in steep and rocky meadows and are extremely hardy. Toggenburg Goats reach sexual maturity at an average age compared to most other goats. Their litter size is also average, and they produce plenty of milk for their hardy offspring.